Wedding Jewelry, Sterling Silver Wedding Bands: Real pheasant feathers were replicated in sterling silver, for these unique wedding rings, complete with true imperfections in the fibrous strands from battling weather and avoiding predators. The silver feathers overlap for a unique and cool finish, oxidized and hand spot polished to give these rsilver wedding rings a inimitable rustic luster. Remember, birds of a feather flock together. 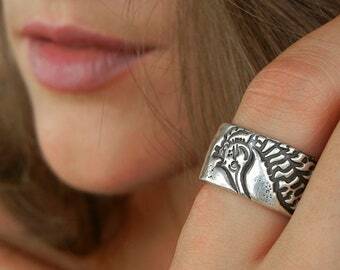 Solidify your commitment to each other with these unique handmade feather wedding rings. Your custom pair of silver pheasant feather rings will be like the ones pictured- funky, shiny, unpredictable, obviously hand made just for you. Flip it or spin it to wear the overlap on top, or for a more subtle appearance twist it to show the smooth part, and you have 2 cool silver rings in one. Perfect and rugged for a man, slender & fashionable for a woman, the pair exudes a unisexy allure. The rims are slightly curved for perfect comfort to wear them for the rest of your lives. 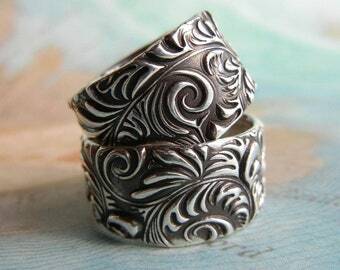 Feel good about wearing these boho chic wedding bands as they are recycled silver which means no new silver was mined. His thick silver band will be ~9-11mm at the widest point, or about 3/8" so he might want to bump up a half size to his regular size for comfort. Hers will be thinner, about 6mm at widest point. Your initials OR date OR short word can be stamped on the inside for $6 each ring. If you choose to personalize, please know personalized pieces like this are 100% non-refundable/exchangeable/returnable due to their personal nature. Purchase serves as agreement to the final terms of sale. 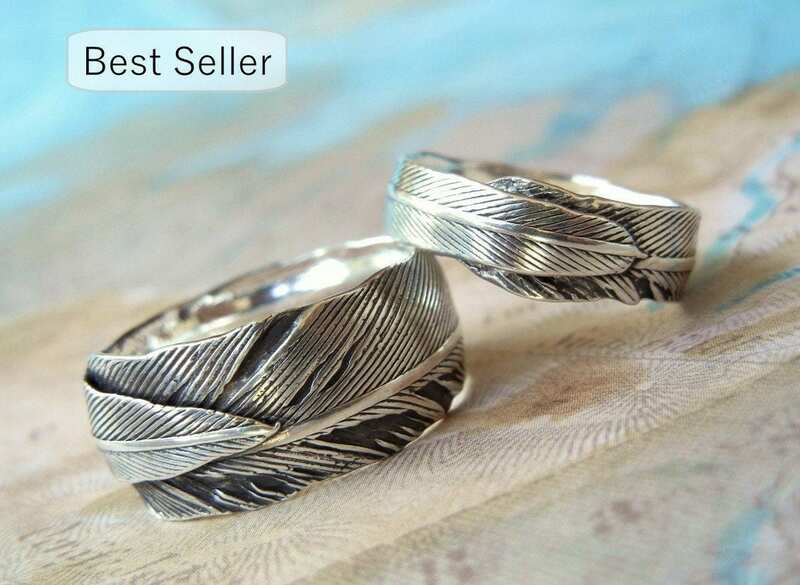 >>> This listing is for a PAIR of his & her feather rings <<< Other jewelry is shown as examples of our work, offered for layering and stacking inspiration, and can be purchased in our shop. See links below. Magnifique création fait avec beaucoup de soin et de professionnalisme nous sommes heureux. These rings ROCK! Both my hubby and I love them! Thanks so much!